Femoroacetabular impingement (FAI) is a common cause of hip pain. Impingement occurs because of an abnormal shape of the ball or socket of the hip joint. There are two types of FAI. The first type is called "cam impingement." In cam impingement, the femur (thigh bone) has a bump on it. This bump rubs against the hip joint whenever the leg moves. This is more common in young, athletic males. The second type is called "pincer impingement." 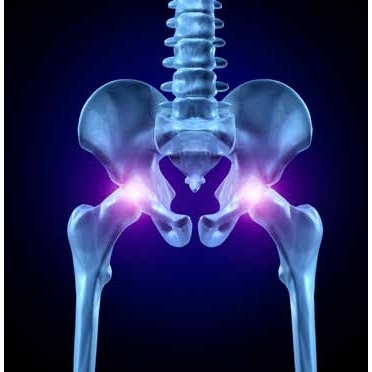 This occurs when the socket of the hip, the acetabulum, covers too much of the top of the femur. Pincer impingement is more common in middle-aged women. Commonly patients have a combination of both a pincer and cam impingement. Patients with FAI are at risk for tearing the labrum. The labrum is a type of cartilage that forms a ring around the socket of the hip joint. A major injury like a hip dislocation or even just overuse can cause a labral tear. Patients with FAI usually have groin pain whenever the leg moves forward or backward or when it twists. The pain may occur with sports like hockey, soccer, or football, or it may occur with walking, running, or prolonged sitting. Patients may also feel clicking or catching in the groin if there is a labral tear present. On physical exam, patients may have decreased movement of the hip. X-rays are often very helpful in making the diagnosis of FAI. Advanced imaging may be done to confirm a labral tear. The most common test ordered is called magnetic resonance (MR) arthrogram. It is like MR imaging (MRI), but dye is injected into the hip so that the labrum is more easily seen. There is no specific way to prevent FAI but patients with hip or groin pain should limit activities that cause symptoms. An athlete that continues activities despite pain may damage the labrum of the hip. That is why it is important to see a doctor if there is painful snapping or locking in the hip or groin. Once a patient has been diagnosed with FAI or a tear of the labrum, a patient will perform exercises to decrease stress on the hip. Athletes are progressed back to sports once they have good movement, strength, and are functionally ready to play their sport. 1. Samora JB, et al. Femoroacetabular impingement: a common cause of hip pain in young adults. Clin J Sport Med. 2011; 21(1):51-6. 2. Sankar WN, et al. Femoroacetabular impingement: current concepts and controversies. Orthop Clin North Am. 2013; 44(4):575-89. 3. Sink, EL and Kim, YJ. Femoroacetabular impingement: current clinical evidence. J Pediatr Orthop. 2012; 32:S166-71.